The Mentawai Islands are a chain of about seventy islands and islets off the western coast of Sumatra in Indonesia. Siberut (4,030 km²) is the largest of the islands. The other major islands are Sipura, North Pagai (Pagai Utara) and South Pagai (Pagai Selatan). The islands lie approximately 150 km off the Sumatran coast, across the Mentawai Strait. The indigenous inhabitants of the islands are known as theMentawai people. 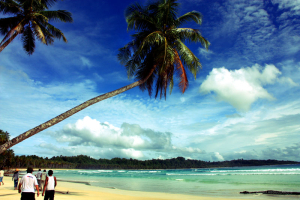 The Mentawai Islands have become a noted destination for surfing. The Mentawai Islands have been administered as a regency within the West Sumatra (Sumatera Barat) province since 1999. The regency seat is Tua Pejat, on the island of Sipora.